The recent spike in the number of violations of the Federal Fair Labor Standards Act has resulted in dozens of multimillion- dollar lawsuits from both large and small businesses. Federal employment laws were not written to assist small business owners in running their businesses, making it difficult to understand the somewhat complex legalese. 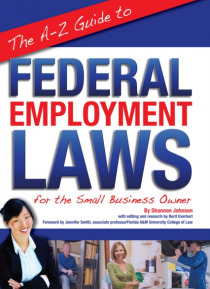 Luckily, there is an easy way to avoid being one of th… e numerous companies involved in class-action labor lawsuits.The A-Z Guide to Federal Employment Laws for the Small Business Owner details the labor laws you must follow as a small business owner to stay in good standing. In a clear, easy-to-understand format, you will learn every detail to stay ahead of the government's requirements and run a successful business. You will learn the intricate details of the federal acts and how they apply to you and your business. You will learn everything in regards to age and disability discrimination, equal pay requirements, affirmative action, civil rights enactments, and worker retraining as it relates to your business.There is a run down of each kind of business and how certain worker-safety laws, such as OSHA, EPPA, and COBRA, apply to your business. The tools you need to comply with these laws are provided in entirety, along with the federal and state agencies you will be working with. If you are considering starting or expanding your business, this book will provide every detail you need to effectively manage and maintain your growing workforce.Atlantic Publishing is a small, independent publishing company based in Ocala, Florida. Founded over twenty years ago in the company president's garage, Atlantic Publishing has grown to become a renowned resource for non-fiction books. Today, over 450 titles are in print covering subjects such as small business, healthy living, management, finance, careers, and real estate. Atlantic Publishing prides itself on producing award winning, high-quality manuals that give readers up-to-date, pertinent information, real-world examples, and case studies with expert advice. Every book has resources, contact information, and web sites of the products or companies discussed. This Atlantic Publishing eBook was professionally written, edited, fact checked, proofed and designed. You receive exactly the same content as the print version of this book. Over the years our books have won dozens of book awards for content, cover design and interior design including the prestigious Benjamin Franklin award for excellence in publishing. We are proud of the high quality of our books and hope you will enjoy this eBook version. Raccolta: Atlantic Publishing Group Inc.